Only a few days left until our Local Chefs Tasting Pop-Up in conjunction with The Welcome Table! Buy your tickets quickly, as tears will not be accepted at the door. Today we’re featuring Chef Florvil “Flo” Valdez of ServeMeNow.org. We asked him to talk to us about himself for a little bit in anticipation for Monday, and his passion for food and community really shone through. A: I made the decision that I wanted to be a chef right in my junior year of high school. Up until then, I actually wanted to go into the medical field, into anesthesiology, and cooking was just something that I had just always done. 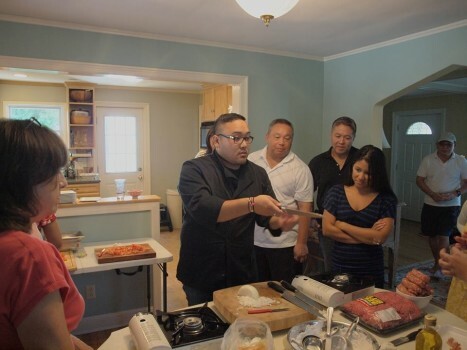 And in the back of my mind, just like any young chef, I wanted to open my own restaurant, manage the business, etc, but, being raised in a Filipino household, it was always about the medical field, or business, or some kind of accounting, something like that. That’s what I always grew up with. Cooking was a whole other kind of thing, and that’s when I decided to look into it, and I decided, you know what, there’s a university in Rhode Island where they had a Bachelor’s Program in Culinary Arts, and that was the only way I could convince my family to agree to it, because there was a degree involved. And the rest is really history, I just dived right into it and love it to this day. A: Yes, actually the first time learning how to make a traditional Italian gravy, which was basically a sort of tomato sauce. One of my best friends growing up was Italian-Cuban. His mom would always cook her traditional Sunday gravy, and I remember I came over one time and watched her, and at first I didn’t understand why she would have the pot on stove simmering all morning. I then why things were done that way, I saw how it was partly nostalgia for her too, because that’s how she learned to make the gravy – to simmer low and slow, to give it such a good flavor – and that’s how I started wanting to cook, to learn how to make good Italian food from my friend’s mom, and that’s actually why my specialty is in Italian and Mediterranean cooking. I still remember that same pot and all the ingredients that went into the gravy. To this day, I actually still use the same recipe that she used on that day about 15 years ago. She loves that story, she loves it when I tell her it and when I tell other people. I was definitely influenced by what she did. Chef Flo’s skills with a knife. Q: What role did food play in your life growing up? A: It was the center of everything. Growing up in a Filipino household, whenever we had food on the the table, that is when we would always sit down together as a family, and not just our immediate family, but our extended family as well. When any family came over, it was always about the food. Everyone would bring a dish over, it was all potluck, and everyone was known – all my aunts, all my family members – for their respective speciality dishes which they’d always bring with them, up to this day. So, food always reminds me of that, because that’s how I started learning how to cook, from my own parents. I learned that whenever there is food out, that is when people come together. Even now, when I get together with family and friends, it is always centered around food. Q: Any comfort foods or guilty pleasures? A: There’s a Filipino noodle dish called Pancit, it reminds me of my childhood. Noodles, tons of vegetables in there. Traditionally there is usually some ground poultry or meat as well. We eat in our celebrations because it’s a sign of long life, we always have to have it at birthday parties for its long noodles. A: My inspiration actually all just comes whenever I shop. It never starts in my desk or on a notepad. It starts when I go out and seeing what inspires me to make something new, whether it’s something at the market or at the grocery store. It usually starts at the produce department, whatever I see there that seems the freshest right then and there, that’s when I’ll decide, let me just work with this new ingredient. I always start from what’s available right now. Seasonal foods really get me going, it really does. Because that’s the only time when something that looks good on a market stand or a grocery store even that looks beautiful and also tastes good. Most my food centers around good fruits and vegetables, it always starts out that way. I actually used to work for Whole Foods Market for quite some time, and grocery stores are actually designed that way – whenever you go into the store, the produce department is usually the first department that you run into, and that’s the way I start my recipes. I think, “What’s good out there?”, and then I build around that. A: My style is simple, good food. I was just creating a menu for a client, and however simple I can make it, that’s better. It’s usually just 3-4 ingredients per dish, aside from the regular herbs and seasonings, in order to highlight the main ingredients. That’s definitely the way that I always cook, and how I market myself. Whenever I cook on my own or for my clients, I always focus on the simplicity of the food in order to highlight the main ingredients. A: Once a week usually, I make a gravy. I have the recipe I mentioned earlier, but recently I have been transitioning to removing the added fat from my diet, so I actually create my own gravy now without any added oil, all vegetables. It’s a kind of stew, no added salt, and no added oil, so that is my go-to dish these days. It acts as a sort of “mother-sauce” to any other dish I may make, as a kind of base component for things like pasta sauce. It’s a staple in my kitchen that I almost always have to make. A: It’s not about the recipes or the food that I create when I work, it’s not about me. It’s always about the food itself, and serving the client, and what it is they like to do. I’m not the kind of chef that likes to highlight my food, yknow? It’s not about *my* recipes or anything like that. It’s just about creating a space for great food and just enjoying it. I’m never opposed to just picking up any cookbook and just taking from it if that’s what the client wants, what they’ll actually enjoy.